The Brown List: Samcheong, cha-cha-cha! 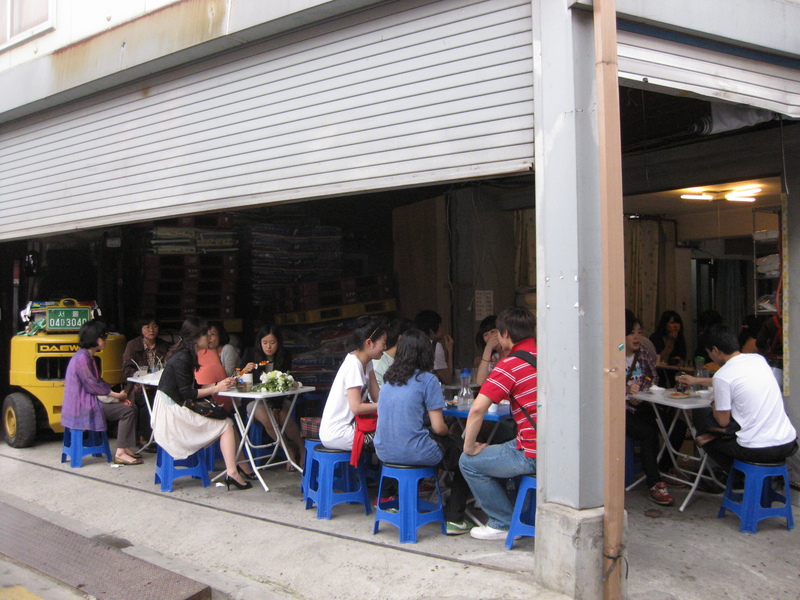 Arguably the most bougie-boutiquey neighborhood north of the river, Samcheong-dong is chockablock with charm — for the right price. Samcheong is conveniently located next to many of Seoul’s finest tourist attractions — within walking distance of Gyeongbokgung Palace and Gyeongbokgung Palace Museum, Cheongwadae (the residence of President Lee Myeung Bak), Gwanghwamun Plaza, and the Korean Folk Museum, where our trip began, in addition to smaller curiosities like the Chicken Art Museum, the Sejong statue in Gwanghwamun and the Sejong Museum under the statue, and a host of other craft museums and galleries. 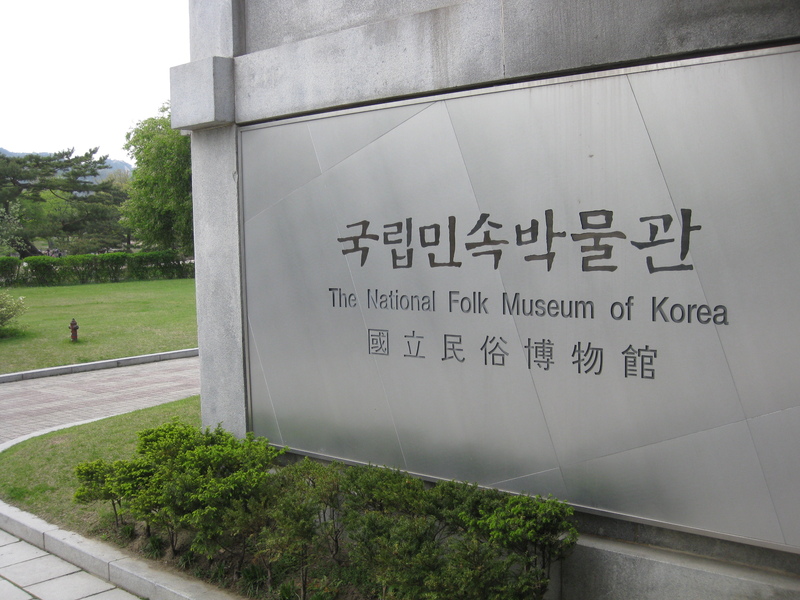 The Folk Museum is a gem among museums and well worth the visit, even for those who are not museum-goers — and it’s free. Well-organized in such a way that those standard-fare bore-you-to-tears specimens of pottery from scattered periods of history manage to come to life, largely thanks to interesting, well-written placards and intricate tableaus of scenes from the lives of Koreans that truly place the objects in their proper context. Walking out of the Folk Museum to the main street and turning left, one need only follow the arrows along the road to go wherever one wishes to — Gyeongbokgung, Chicken Art, Samcheong, etc. Or, if you are particularly hungry at this point in the day, as we were, you can walk left down to Samcheong and scout out the many restaurants in the area. 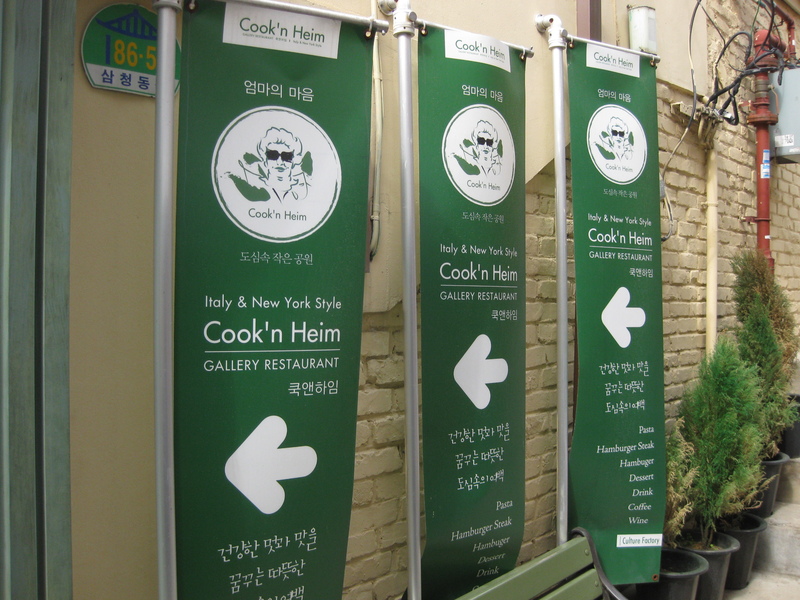 We were enticed inside by this one: Cook n’ Heim, a “gallery restaurant”, whose pretentiously meaningless title belies its glorious bounty: the wine and burger combo lunch. 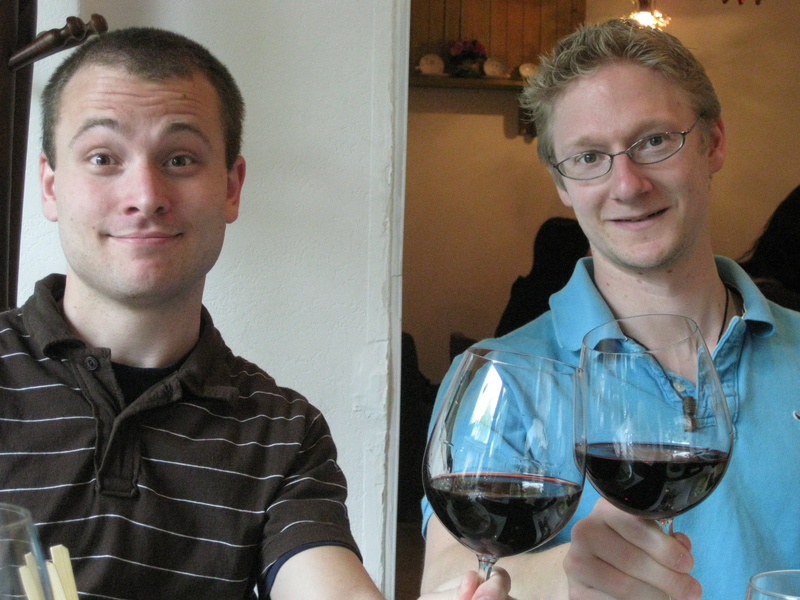 We can cheers to that! 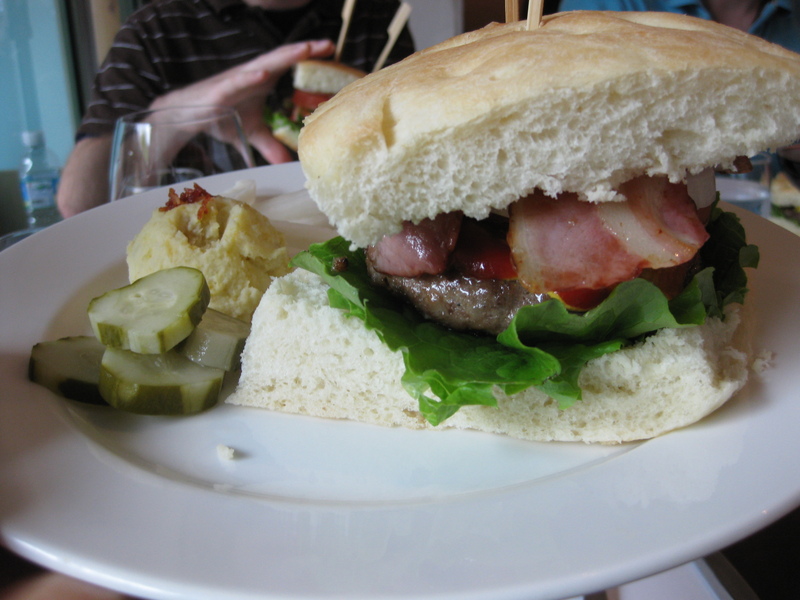 There are a wealth of other burger types to try at Cook n’ Heim, many called ‘Art Burgers” (think Kraze Burger, but good), but most of the patrons seemed to jump at the burger and wine as we did. And it was a delicious combo at that — the burger was perfect, maybe the best I have had in town (yes, even better than Wolfhouse), packed full with beef, cheese and bacon, seasoned just right, and cooked barely-medium rare so that it was still moist with burger juices, served between two slices of moist focaccia with potato salad and the ubiquitous Korean pickles. The wine paired it perfectly and was excellent for a Korean house wine, and all this rang in at 14,000 won. Other restaurants along this stretch of Samcheong are equally expensive, if not more, but all look sophisticated and delicious — and, no surprise, most of them are European, French or Italian, including the haute hamburgers of Cook n’ Heim. 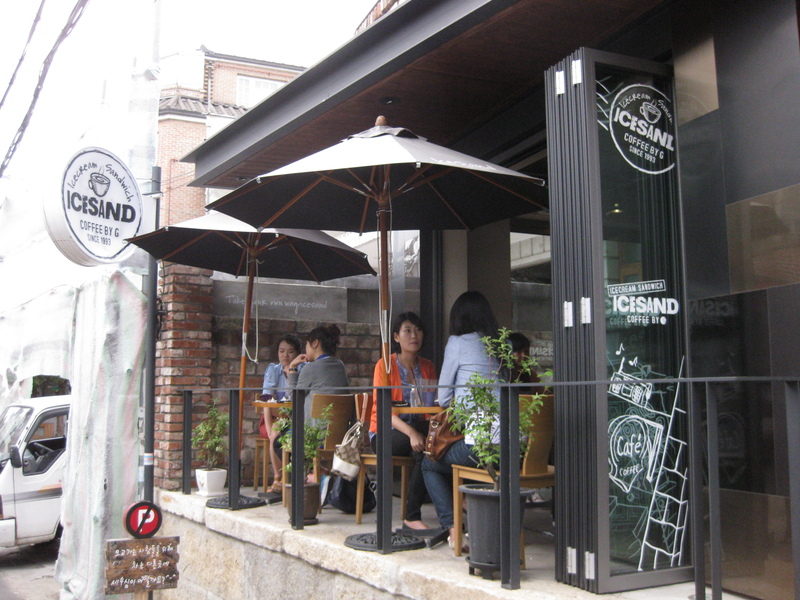 After eating, we went in search of a decent cafe and came across Icesand, a dessert and coffee joint — we had a thing for places with uber-Konglish names, I guess. 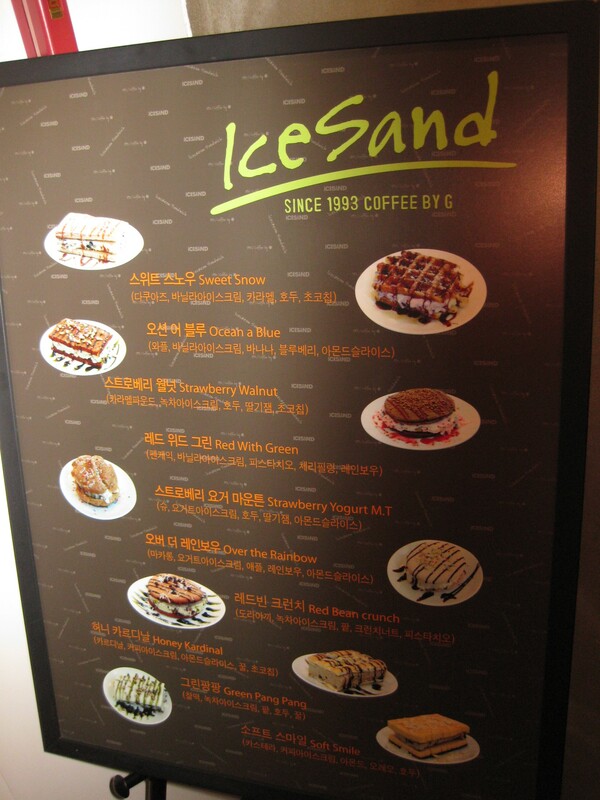 Icesand boasts a menu full of glorified ice cream sandwiches, the star dessert of the restaurant, very similar to the Koreanized ‘Belgian waffles’ one sees all over town. 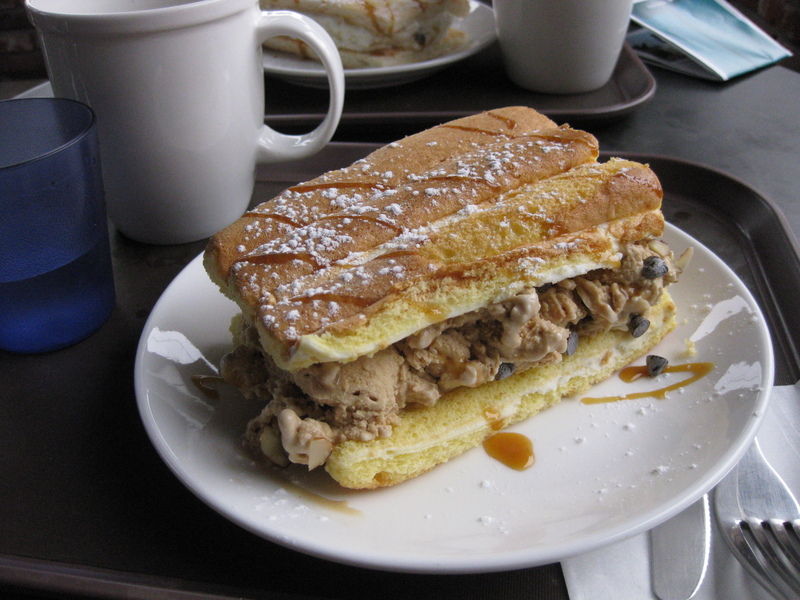 If you are an ice cream fan, you will enjoy it — the ice cream is a bit icy, but good. 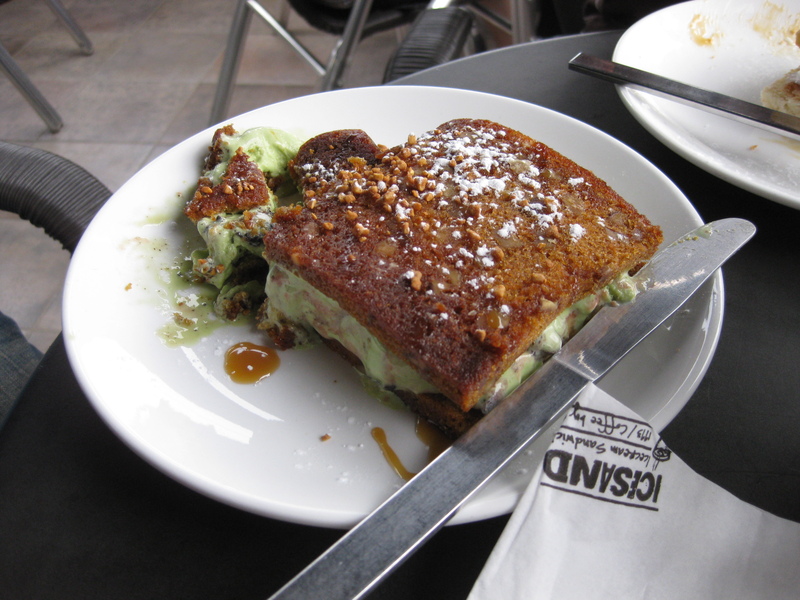 If you are a buttery-dessert type like me, who finds the ‘sandwich’ part more appealing than the ‘ice cream’ part, the offerings are more hit or miss. My ‘sandwich’ tasted like they had covered a stale baguette in powdered sugar, whereas my friend T.J.’s sandwich was a rich, strawberry shortcake with good texture and taste. Directions: To hit Samcheong-dong directly, go out exit 1 of Anguk station and make the first left. Follow this road past several large buildings on your right and within 5 minutes you will hit a string of outdoor eateries selling cheap but delicious-looking food for passers-by. Come hungry and eat lunch along this stretch, then continue to wander around the area window-shopping (or actual shopping if you have the money). 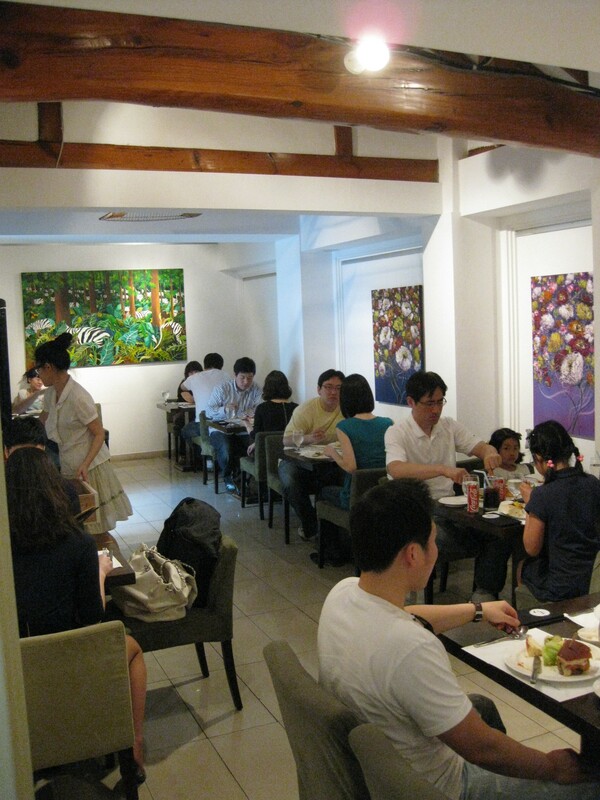 Visit the nearby art gallery right on this street, buy a bottle of makgeolli and relax in the park up the hill to the right, or start scouting out the nearby museums or Gyeongbokgung to get your sight-seeing fix. If you keep walking along the original street, it will extend up a hill and bend around. There is an excellent coffee shop on the corner with an outdoor patio — a little further up is Icesand Cafe, and further still is this warehouse eatery — one hell of a way to dine al fresco! Take a right here and you will hit all the more expensive and shi-shi restaurants, including Cook n’ Heim, which is about two blocks down on the right. If you turn left and continue walking straight, you will eventually see Gyeongbokgung Palace and the Folk Museum on the opposite side of the road. 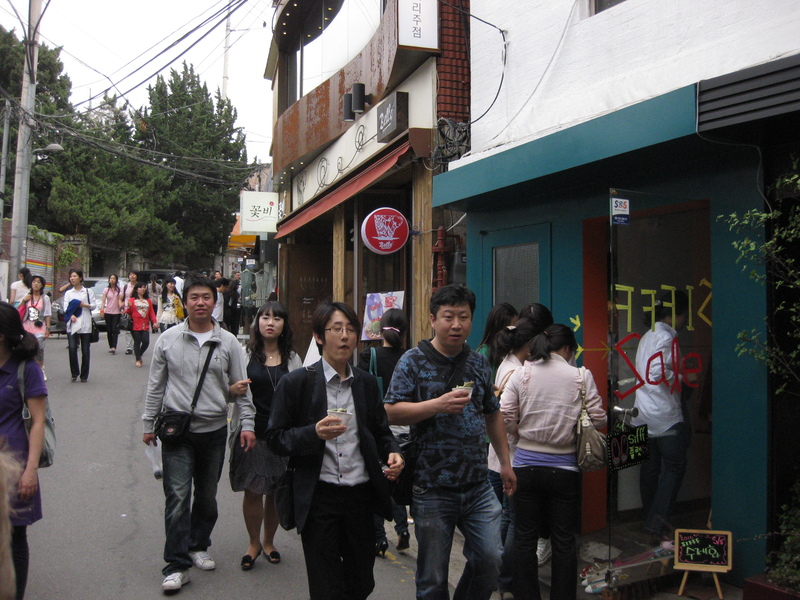 Follow the signs in the neighborhood for other nooks and goodies, or take a longer walk to Gwanghwamun or Insadong.